With KCI no longer around to prey on fair decks, we’ve seen a spike in grindier strategies in Modern. This shift, along with the printing of Creeping Chill, has propelled Dredge to the peak of popularity. Dredge attacks on a different axis than other creature-based strategies, using the graveyard more heavily than any other deck in Modern. The Dredge mechanic allows you to return a card with the Dredge keyword from your graveyard to your hand as a replacement effect any time you could draw a card. In addition to returning the Dredge card to your hand, you’ll also Dredge X – put X cards into your graveyard from your library. 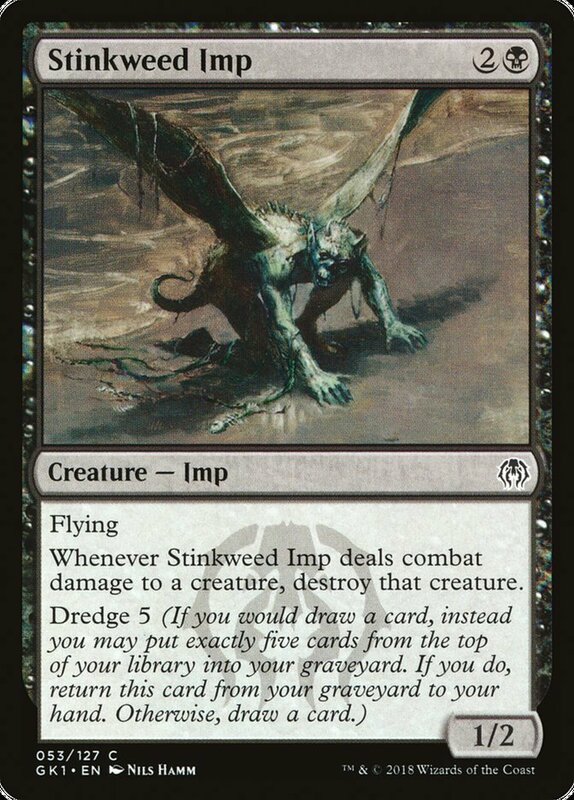 For example, if you replace a draw by dredging Stinkweed Imp, you’ll put the top five cards of your library into your graveyard and return Stinkweed Imp to your hand. The deck turns this potential negative into a positive by finding cards that want to be in the graveyard and bringing those cards onto the battlefield. By eliminating the need to pay mana for spells, Dredge can have explosive starts while still being able to grind through mid- and late-games. Let’s take a look at how the deck works! Given multiple dredge options, you’ll usually dredge Stinkweed Imp whenever possible. The few exceptions to this include when you need a Life from the Loam to get land cards back from your graveyard, or occasionally when you need to cast a Darkblast to deal with an important creature. Also, if games are grindy, it may be more beneficial to loop cards like Life from the Loam and Darkblast by casting them and then dredging them. That brings me to my last point: keep in mind that your dredge spells are useful for more than just dredging. If you’re staring down a large threat, casting a Stinkweed Imp can help buy you time. Stinkweed Imp has pseudo-deathtouch, though it’s important to note that your opponent can respond to the trigger. The deck also includes several “enablers,” or discard outlets. Faithless Looting, Cathartic Reunion and Shriekhorn fill your graveyard with dredgers and payoff cards and dredge those cards once your yard is full. Cathartic Reunion is particularly beneficial: you can discard cards as part of its casting cost and dredge them back upon the spell’s resolution. But what’s the point of all of this work? Flooding the board with creatures as quickly as possible, of course! 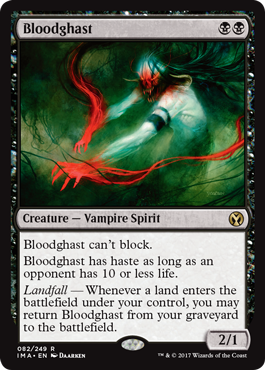 Bloodghast: A potentially hasty creature that can return to the battlefield via landfall triggers. Narcomoeba: A small, but evasive creature, Narcomoeba can enter the battlefield if it was put into your graveyard from your library. Prized Amalgam: The biggest payoff of all. You can return Prized Amalgam from your graveyard to the battlefield on your end step if another creature entered the battlefield from your graveyard earlier in the turn. Ideally, you’ll want to load up your graveyard with Prized Amalgams early in the game, then use a Bloodghast or Narcomoeba to bring them all onto the battlefield. 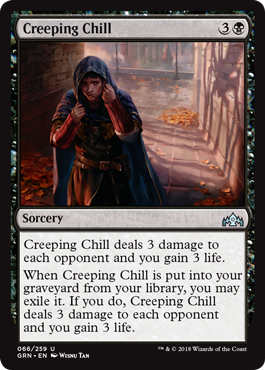 The newest addition to the deck, Creeping Chill, has provided Dredge with added game in the event of a race, such as against Burn or Hardened Scales. Gaining three life while your opponent loses three life can often be the deciding factor in matchups where every card is important. And when you can churn through your deck so rapidly, you’ll often see three to four Chills – that’s a 24-point life swing! Finally, there are the Conflagrates. A Conflagrate in the graveyard is a great way to close the gap on your opponent’s life total if they find answers for your ground threats. In a pinch, it’s also a great way to ensure that more dredge cards find their way into your graveyard. Dredge preys on being able to dominate in Game 1, and win one of the two post-board games. Opponents will likely have some sort of enchantment- or artifact-based graveyard hate (such as Rest in Peace, Relic of Progenitus, or Grafdigger’s Cage), so bringing in Nature’s Claim is a given. In matchups where you can expect hate cards, a full four Nature’s Claims is ideal. Otherwise, hedging with two or three is reasonable in game two until your suspicions are confirmed. If there are relevant creatures that need to be dealt with, it makes sense to swap your Shriekhorns for Lightning Axes. Also, if you’re racing, it makes sense to board out one or two copies of Life from the Loam. If you are playing against a counterspell-heavy control deck, Cathartic Reunion gets worse, and you can consider siding it out. If the matchup is not a race, you can also side out some number of Narcomoeba or Bloodghast. Creeping Chill is also less useful against grindy midrange decks, though I would leave it in against control. Common answers to your graveyard-based strategy include Rest in Peace, Leyline of the Void, Grafdigger’s Cage, and Relic of Progenitus. Good news: the Nature’s Claims out of your sideboard provide a clean answer to all of these options. You should also aim to play a slower game until after you’ve Nature’s Claimed an opponent’s graveyard hate. There are also a bunch of one-time graveyard removal effects you’ll need to watch out for. The variety of your threats allow you to fight through Surgical Extraction, but Ravenous Trap is harder to hedge against. The best way to combat Trap is by keeping hands with multiple dredgers and ways to fill the graveyard. Bojuka Bog is a less effective option, since your opponent can only play it on their own turn; you’re likely to have already completed a powerful turn by the time it comes into play. There are also some creatures that interact with the graveyard, such as Scavenging Ooze, Anafenza the Foremost, and Remorseful Cleric. I’d recommend sideboarding in Lightning Axe if you suspect your opponent has any of these threats. Additionally, you should play cautiously around Anafenza, try to bait action if they have Remorseful Cleric, and maneuver around Scavenging Ooze by waiting to dredge until your opponent is tapped out. If you’re struggling to find answers to graveyard hate, you can always play a fairer game by hard-casting your dredgers and payoff cards. It will be a little slower, but it can still get the job done! If you’re using Shriekhorn on your opponent’s turn, it’s best to activate it at the end of their second main phase. That way, if a Prized Amalgam in your graveyard triggers, it will enter the battlefield at the beginning of your opponent’s end step. If you activate Shriekhorn on their end step, Amalgam won’t enter the battlefield until your next end step. If you dredge multiple times as part of the resolution of a spell, the triggers don’t go on the stack until after that spell has completely resolved. For example, Cathartic Reunion won’t resolve until you’ve drawn (or dredged) all three cards. Only then will triggers from cards like Creeping Chill and Narcomoeba go on the stack. This means that if a Narcomoeba enters the graveyard during the first dredge, and a Prized Amalgam enters the graveyard during the third dredge, the Prized Amalgam will still trigger because the Narcomoeba doesn’t go on the stack until Cathartic Reunion has resolved completely. If an opponent casts Surgical Extraction targeting a card while its trigger is on the stack, the trigger won’t resolve. For example, if Surgical Extraction targets Creeping Chill while its trigger is on the stack, the trigger won’t resolve because Creeping Chill must be exiled from the graveyard upon resolution. It’s important to have two lands in play before you “go off”; in fact, cards like Cathartic Reunion and Life from the Loam require it. In addition to helping you hit land drops, Loam also lets you refill your hand for Conflagrate. Dredge has a lot more play than many players expect. You need to constantly evaluate board states and anticipate hate cards; how much to commit to your graveyard post-board and whether or not you’re the aggressor. However, Dredge’s powerful synergies and fast clock make it a contender for the title of Best Deck in Modern. It’s exactly the type of deck that you should be looking to sleeve up for your next tournament.